B. Thomas (Arlington, Texas, United States) on 20 February 2014 in Lifestyle & Culture and Portfolio. As part of the entertainment during the rodeo, performers reenact life in the old west including a shootout. Très bien éclairé et belle scène. awesome compo and presentation !!! Beautiful on the black background ! Great capture. Superbe rendu dans ces difficiles conditions !! excellente prise! Fantastic shot B !!! What a beautiful shot with the light on the horse and rodeo !!!!!! Love this! Especially with the low light! Very dramatic! Gorgeous light, excellent shot, wonderful image. 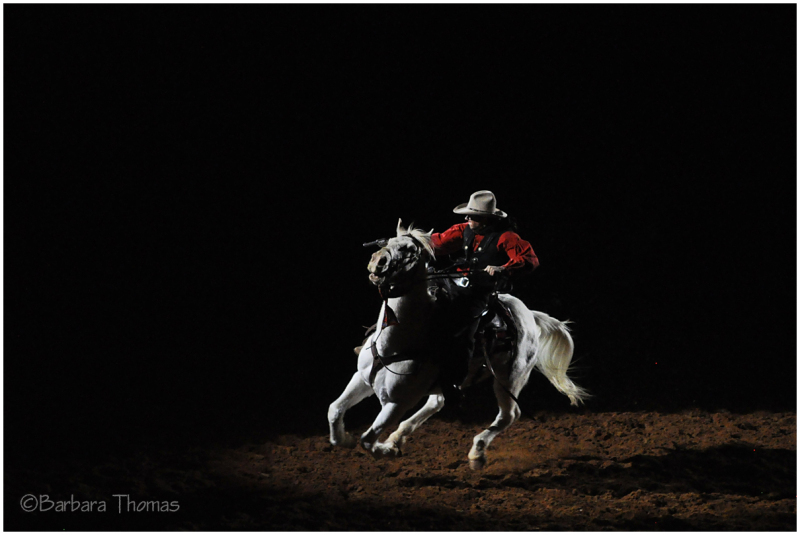 Magnificent shot - love the action and the only light on the rider. Eine ganz besondere Beleuchtung - einmalig ! Incredible detail captured in this shot under the dramatic lighting! Very dramatic with the selective lighting. Finally they paid attention to my photographic wisdom!! Je suis très contente !!!!! Superbe prise ! Félicitations pour ce spotlight ... bonne journée à toi ! awesome capture! congrats on the spotlight! Une belle récompense pour cette série ! bravo! Many congratulations on your Spotlight, Barbara. Absolutely fabulous image! Gorgeous light and color. A great action shot! Congratulations on the Spotlight Barbara! Very well deserved! This is a wonderful work Barbara !! Congratulations on Spotlight ! !